The tournament consisted of four rounds of Swiss followed by top-4 cut and single elimination playoffs. All games were played in best-of-five Conquest format with one ban. Follow me on Youtube for more tournament videos! Hunter and Priest continue their stay at the top, with Warlock close behind them. 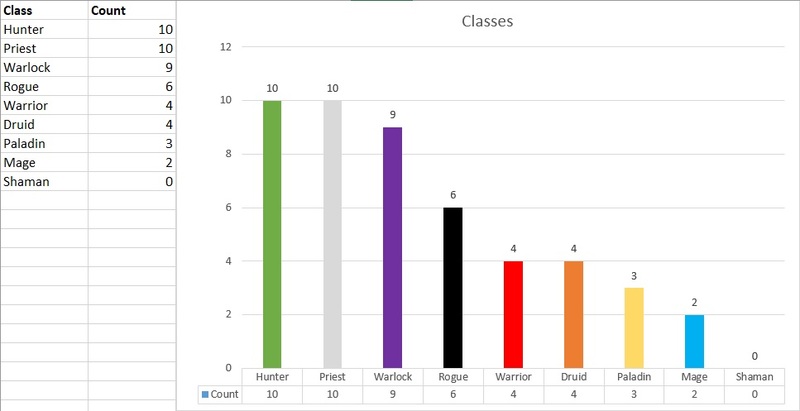 Rogue numbers had dropped from the previous tournaments, and Shaman was completely absent – an unsurprising result for a class that just had its only viable archetype nerfed. Typical for early meta, there were tons of different archetypes: 22 overall with just 12 players! Deathrattle Hunter returned to the scene in force, at least for now, and there were surprisingly many Even Warlocks, considering the lackluster performance of the archetype on the ladder lately. Quest Rogue also returned to the forefront of the tournament meta once again. The new ladder hype deck Wall Priest was brought by one player, Justsaiyan. This does not make Quest Rogue look good. Priest and Hunter have so many archetypes present that it’s impossible to say which ones were good – or maybe they all were! Paladin, Warlock, and Druid were able to stand their ground, whereas Mage and Warrior looked weak. Regarding Warlock, it should be noted that Cubelocks and Mecha’thun Warlock finished near the top and Evenlocks near the bottom. Master’s Cup is a small tournament, so the sample sizes are very low and it is difficult to draw conclusions from the data. It was also held very soon after the second wave of nerfs, so the meta was nowhere near stable yet. That said, it is always interesting to look at what happens in tournaments. Previous Previous post: Old Guardian Youtube channel reaches one million views!